Wow I wanna live there! Need a place to charge your batteries? Plug into Surge. 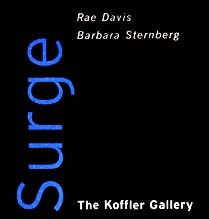 It's the living room created by filmmaker Barbara Sternberg and installation artist Rae Davis at the Koffler Gallery in Toronto. A wonder of organic forms, structural frames, ephemeral memories and dancing light. Everyone is immediately drawn to the liquid wall. The vision before us seems to be breathing. Clearly the soul of this space, I claim it as my boudoir. The all encompassing image is at once both soothing and intriguing. This trickster of perfect deception seems to coax the child out of everyone. It is turning perfectly staid and cocktail ready adults into playful explorers. I know of no one who resists playing with the shadow they cast upon this luscious wave of water. It surges and ripples before them. Maybe it is the magical contrast of their negative space against the light of the wall that draws them. Hand puppets, rabbit ears and Alice in Wonderland, dance and slip into view when 'no one is looking'. The abutting wall curves gracefully. 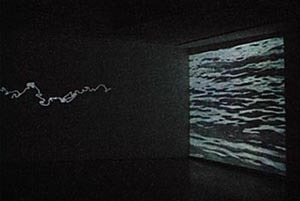 Along it, is an animated image of a line scrawling, coiling, stretching, as it moves through time. I vaguely think of the flicker of 19th century shadow boxes, Madame Curie's photon photographs and Man Ray's rayographs . The energy of the coils, jerking and tapping it's morse code of motion,seems in dialogue with the flowing swells of the deep water beside it. White on black -black on white, the tension is easily holding the space.